Although the Phanerozoic diversity trajectories and the databases used to construct them have proven to be robust, their interpretations have remained problematic. For the observed increase in familial and generic diversity, three basic models derived from population ecology can be invoked to explain the pattern (Miller 1998; Benton 2001). First, if rates of species origination and extinction were unconstrained by existing diversity and origination exceeded extinction rates, an exponential increase in taxic diversity will result, only interrupted by major extinction intervals. The second, linear model of diversity increase requires the addition of a fixed number of taxa in each unit time. This would require a constant decrease in the rate of evolution (speciation) or a regularly increasing rate of extinction, and this model is generally rejected as improbable (Benton 2001). The third, density dependent model assumes that after an initial slow diversity increase a rapid rise occurs, followed by a slowing rate of increase, and finally a plateau (logistic growth). 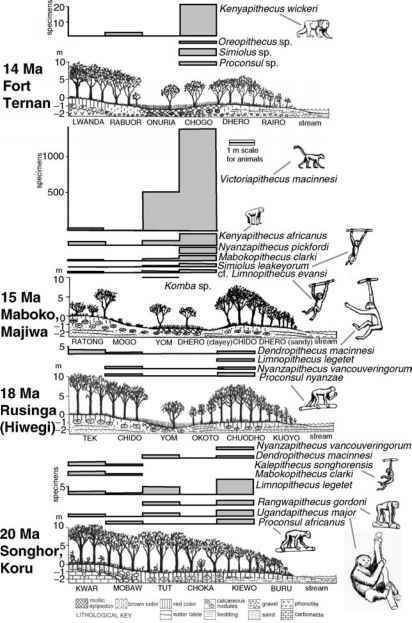 In a "decoupled logistic'' simulation of the three Phanerozoic evolutionary faunas at the family level, which allowed for major mass extinctions, Sepkoski (1981, 1984) achieved a rather good fit to the observed picture. In a variation of the theme, it was proposed that the diversifications from Ordovician to recent were best matched by a series of four simple logistic curves without interaction between evolutionary faunas and only reset by mass extinctions (Courtillot and Gaudemer 1996). Exponential growth (Benton 1995) is currently no more supported for marine animals, but the exponential or nearly exponential increase in several terrestrial groups indicates that these taxa are still far away from reaching a saturation (Benton 2001).